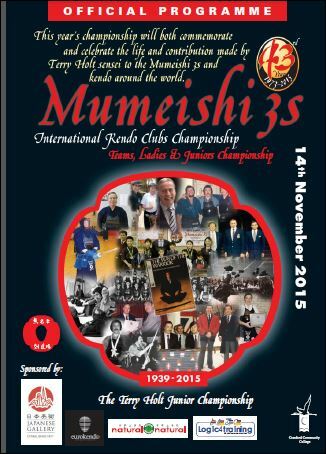 Next weekend we will host the 43rd Mumeishi 3s competition, the first without its founder Terry Holt sensei. Terry always put an enormous amount of effort into organising this taikai, so this year the members of Mumeishi kendo club have had to step up to the mark and make an even greater effort than in the past to gets things ready for the event. We start on Friday evening to set out the stands, put out the banners and mark the courts and the work of running the taikai continues until the last visitors return home on Sunday afternoon. I am sure that those of you who have been involved in organising kendo competitions will know the hard work starts a long time before the event. This year one individual in particular, Mark Krull took on the massive tasks of publicising the event, registering the competitors, organising the draw and producing the programme. Other members have recruited sponsors, organised food and refreshments, arranged the after event party and taken on the numerous other tasks that go to making an enjoyable competition. This year we are expecting 64 teams , forty entrants for the ladies competition and forty five juniors for The Terry Holt Junior Championship, which has been renamed in Terry’s memory. We are anticipating some great shiai and some excellent keiko on Sunday when we open up the hall at 9.30 for an all morning keiko session, Those who have to leave early, can start early, and anyone that might have celebrated a little too hard at Saturday’s sayonara party can join us later. I am looking forward to the weekend with slightly mixed feelings. The “3s” is always a one of the highlights of my kendo year, but it will be strange not to have Holt sensei there . I only hope that all our visitors enjoy themselves and that this and future Mumeishi 3’s live up to Terry’s high standards. We will certainly do our best and when it’s over raise a glass to Holt sensei. I am back in the UK after a break in Spain where I had the pleasure of training with the members of Shion dojo in Estepona. I enjoyed keiko and socialising with everyone over a beer afterwards and got some tips on good places to visit in the area. By throwing my men and kote into my hand luggage, I immediately went from being a tourist to visiting friends. Later last week I received a Facebook message from a French reader asking about beginners classes in Osaka and I am waiting on an answer to an email before making an introduction. I enjoy the benefits of social networking. Like many people of my generation I am a relatively late convert to Facebook, I can’t keep my messages short enough to master Twitter, but as a head-hunter I make extensive use of LinkedIn, which I see as an extremely useful business tool. Although I am a member of the Kendo Business Professionals forum, I tend to separate my kendo social life from my business activity, so LinkedIn is reserved for reaching out to people with job-offers and following up references while Facebook is a way to keep-up with my wider circle of kendo friends. The contact I have with people on LinkedIn is very positive. Most are extremely generous in offering advice and referring people to help and be helped, I find however that there is something very transactional about these on-line relationships. People talk about “paying-forward” which to my mind means doing a favour for someone in the hope that they or one of their contacts will do the same for them when they need it. Relationships in kendo however, be they face-to-face or on-line appear to be much more selfless. We are a network where people give without asking for anything in return, now or in the future. I imagine that the same could be said be said about other common interest groups, I am sure that Rugby players, Rotarians, Sudoku aficionados and Sci-Fi fans all have lots in common with others of their kind, but I believe that kendo is unique in welcoming visitors regardless of grade, with open arms. A number of other martial arts have a very different policy; admittance to the group is often jealously guarded, at least to those who are not prepared to pay a membership fee. I have practised kendo now in dozens of countries, referred friends and students to dojo around the world and welcomed numerous visitors to kendo in the UK. 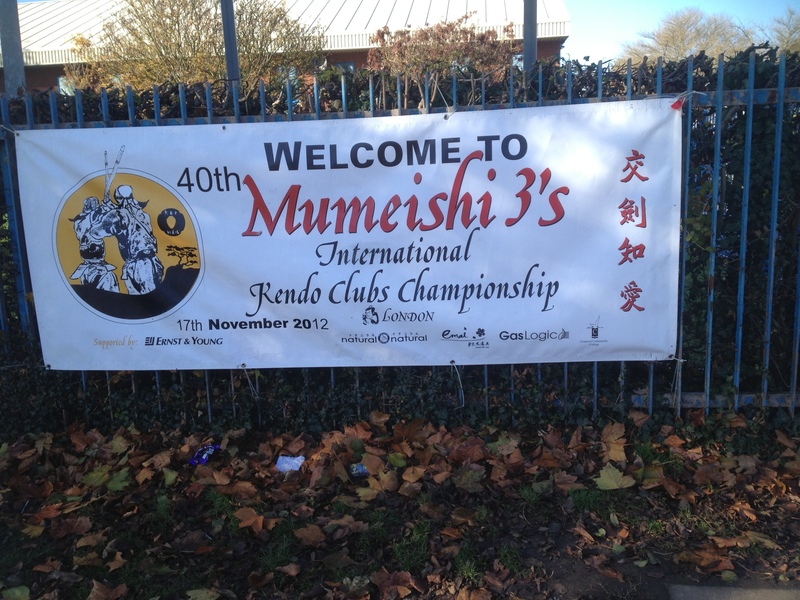 With luck we will be able to welcome many more for the Mumeishi 3s in November. In the meantime thanks to all in Estepona for making my summer break special. We just finished another Mumeishi 3s Taikai. This year’s event was held with slightly mixed emotions its founder and driving force, Terry Holt sensei was unable to attend as he is undergoing tests in hospital. It was never in doubt that the taikai would go-on with or without Holt sensei attending, as so many people look forward to this annual event. 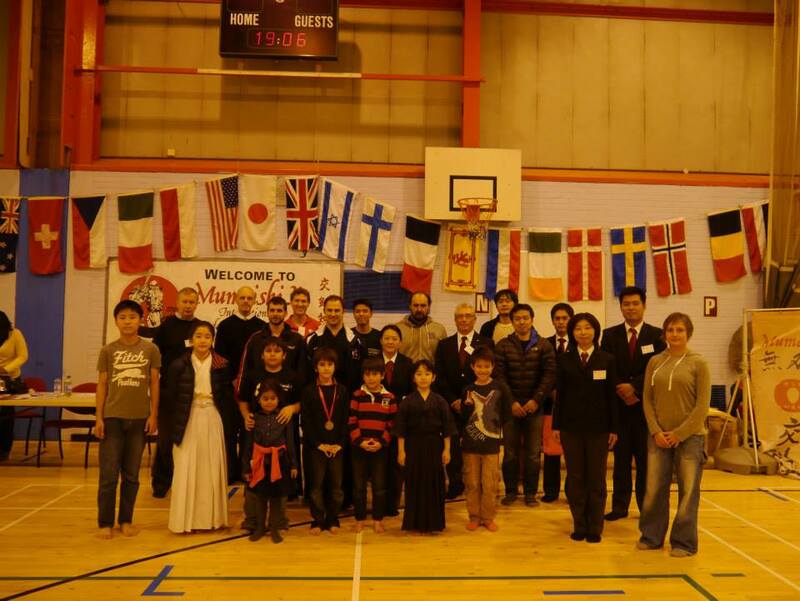 Thanks to the efforts of the Mumeishi members guided by Emiko Yoshikawa and Paul Budden sensei’s organising skills as Tournament Director, the competition ran like clockwork. My own contribution as shinpan-cho was greatly assisted by the two shinpan shunin Michel Guentleur from France and Chris Maes from Belgium. Although a friendly family event, it is not easy to manage as in effect, there are three competitions run on the same day. 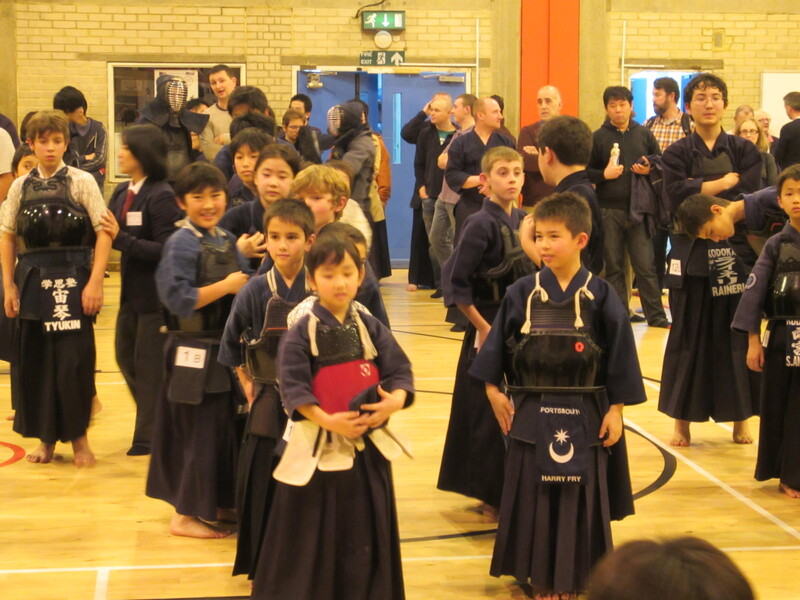 In addition to a mixed grade, 3 person team competition, there are ladies’ individual matches and 4 separate age categories for children; the youngest being judged on hantei and the older groups performing sanbon shobu. With competitors from a wide range of ages and technical abilities, and a register-on-the day policy for the kids, there are always a few surprises, but we always seems to glide swanlike to a successful conclusion in line with the planned finishing time. It is interesting that a loosely connected group of amateur enthusiasts who rarely work together can instantly turn into a high performing team. The obvious conclusion is that we all love what we are doing. The second part of the event is much simpler- we have a monster 2 hour godo-geiko on Sunday morning which people are free to join or leave as and when they wish, to fit in with hangovers or travel schedules. As a motodachi without a plane to catch, my own keiko invariably runs for the whole two hours. I am sure that I will feel the effects tomorrow, but it will be well worth it. It’s always good to have a chance to practice with new people or those that you rarely meet, and with competitors from Belgium, Denmark, France, Russia, Israel, Ireland plus friends from other parts of the UK; it was an interesting session. Of course there is a lot to look forward to next year, both with domestic and international kendo and I am hoping to take part in a number of events, however I am already looking forward to next year’s Mumeishi 3s, hopefully with Holt sensei back in charge. Competitors in the children’s group. I spent my Saturday as Shinpan-cho of the Mumeishi 3s Championship. It’s now the 5th time I have taken on this role in various competitions and whilst it is good to have a privileged view of all the courts, it feels a bit lonely sitting out there on your own. As you know, shinpan-cho are responsible for making the standard of refereeing at any taikai is as good as it can be. They need to ensure that the allocation of referees to each shiai jo gives an even balance of refereeing skill, so that fighters have an equal chance wherever their match occurs. The shinpan-cho also sets the pace and nature of the competition by the instructions that he or she gives to the referees in a meeting before the opening ceremony. For instance, guidance to strictly enforce tsubazeriai rules and to penalise unfair pushing in the early matches results in cleaner faster kendo for the duration of the competition. Shinpan-cho also act as ombudsman and have the final jurisdiction over “Igi” objections from managers or players if the shinpan-shunin for the court in which the dispute happened, is not able to resolve it. Just to make it clear, Igi can apply to procedure, but not to the judgment of points. Even if the man in the middle disagrees with the referees on what is and what is not ippon, their decision stands. The one element of the shinpan-cho’s job that I don’t quite understand, is that he is responsible for keeping the league table up-to-date as the matches progress. This means that while he is looking at the performance of referees on a number of courts at the same time, he is also has to record the results of all matches. Personally, I am not sure if this is really essential, because detailed information is kept by the officials on each court and is then transferred to a central sign board. On Saturday, because of court layout signboards for the three courts were on my side of the hall. I had to rely on messengers to bring me the results. Obviously they had other things to do without me demanding their time. And I found it quite difficult to watch all courts at the same time and to fill in the league table. Of course keeping an eye on three shiai-jo was comparatively easy, when you consider that some competitions have up to eight courts running simultaneously. Regular readers of this blog will know that I am a great believer that the traditional elements of kendo are there for a good reason and I am sure that there must be one in this case. I would welcome suggestions or guidance as to why this duty goes with the role. It may well be that it is an essential part of the job and it is just my well known inability to multi-task that makes it seem incongruous. I was asked to write an introduction for the programme for next weekend’s 41st Mumeishi Threes competition. This must be the oldest privately hosted kendo taikai in Europe and I started to ponder the reasons for its continued success. This event is for three person teams with a minimum of one kyu grade in the line-up. It not only gives more experienced kenshi a chance to demonstrate their skills, but by including teams with a mix of levels, it emphasises the co-dependence of juniors and seniors that is central to kendo. It is an opportunity to strive to do our personal best while supporting our team mates. There are also Ladies’ and children’s individual competitions, with younger competitors judged on “hantei” to encourage their best kendo. The Mumeishi Threes has continued to grow. Over the years it has attracted kenshi from across Europe, the USA and Japan, with over seventy teams competing in some more recent events. This year, at the time of writing, we have registrations from 60 teams, 61 ladies and 40 juniors. Not content with one action packed day of kendo, an after match party on Saturday evening and an exhausting three hour keiko session that runs throughout Sunday morning completes a family friendly weekend and allows participants to meet old friends and make new ones. In spite of current economic conditions and an increasingly crowded international kendo calendar, the Mumeishi Threes becomes more popular every year. The “Threes” could not survive without an army of willing volunteers. Court teams, referees and sponsors are drawn from the club itself and its friends from around the world. Last year Sumi Masatake sensei made the trip from Japan to act as shinpan-cho for the 40th anniversary event. Of course the one ingredient that guarantees the on-going success of the Mumeishi Threes is the untiring effort of Terry Holt sensei, who as soon as each year’s event finishes, promptly thinks about the next one. I am sure that this year’s event will help brighten a dull November and serve as a celebration of all the hard work we put into our kendo. For competitors and officials alike, there is an expectation that we should do our very best on the day. 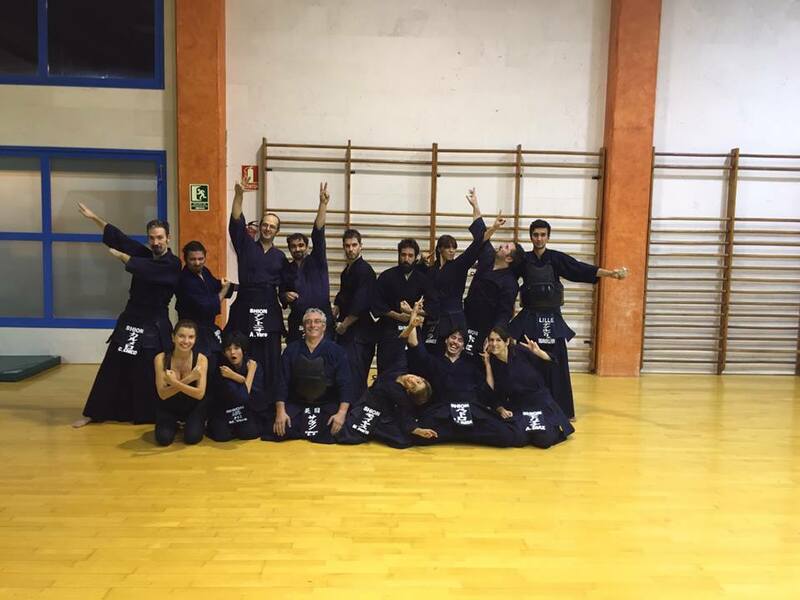 At the same time, we should not forget to enjoy ourselves and to make the most of being together for a very special weekend’s kendo. I seldom write trailers for coming kendo events, but think this one deserves a mention. Next Saturday will see the 40th Mumeishi 3’s Taikai. This must be the oldest club sponsored kendo competition in Europe and is probably a serious contender globally. It is not only long lived, but it is also a big event. This year we have registered 74 teams and an equally impressive number of individual competitors for ladies and children’s matches. For those of you who are not familiar the event, the Mumeishi 3’s has a unique formula. It is a competition for teams of 3 people, two of whom should hold dan rank and one kyu grade. There are also a ladies and a children’s individual competition. The children’s matches are split by age and the youngest are judged on technique and fighting spirit by hantei gatchi. Overall the tone of the competition is one of fun and friendship and it attracts competitors from all over Europe and beyond. In the past we have also had teams from Japan, and the USA. Day two is to my mind even more interesting. A 3 hour keiko session starts at 9.30 a.m. and people are free to come and go as they please. Those travelling home early can enjoy a practice before they leave and those that partied too enthusiastically after the taikai, can catch the tail end. This year Sumi Hanshi and two of our Japanese O.Bs, Hosokawa and Miyagawa sensei will be joining us, so with our friends from Europe we should have an 8th dan and at least 8 7th dans taking part. Not bad for a small West London club practice! Whilst Mumeishi members contribute a great deal of effort each year, the event is driven by the energy and determination of Mumeishi’s shihan Terry Holt. Every year Terry starts the process to attract participants and raise money for the next year’s event while the last one is still fresh in everyone’s mind. On the day, he can be seen rushing around in several directions at once, keeping every detail under control. As a long time Mumeishi member, the Mumeishi 3’s holds many memories for me. I have attended as a competitor, helper and referee. Although I have missed a few years during the times I lived outside the UK, I have been there for most of its history and have seen it grow year by year. This 40th anniversary is special and I am looking forward to catching up with lots of old friends and meeting some new ones. Congratulations Terry! Here’s to another 40 years.